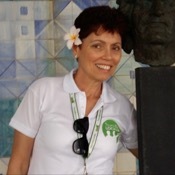 On January 4, 2014 Rosangela was our tour guide in Rio de Janeiro/Brazil. We only had 4 hrs. ; but, we could have spend the whole day with Rosangela. She is truly a professional tour guide. She knows her city inside-out; not only the interesting sights; but, the history and the nowadays concerns of the city and country. She is educated and her English is flawless. We thoroughly enjoyed the time we had with Rosaangela. She is a generous and warm person; next time in Rio we are with Rosangela!! TOUR GUIDE RESPONSE: Hello Frieda! Thank you very much for your nice words and you may rest assured that was my pleasure to have you here with me. I will be anxiously waiting to have you once again here soon.